Merkle's Bar and Grill is renaming itself The Pink Flamingo to help Joe Maddon with his dream to own such a bar. WRIGLEYVILLE — One Wrigleyville bar is hoping to make Joe Maddon's dream come true. No, they can't help with the World Series, but Merkle's Bar and Grill is hoping to cross a different dream off Maddon's bucket list: owning a bar call The Pink Flamingo. "My goal in life is to eventually own a bar named the Pink Flamingo. If that ever happens, you know I've made it," Maddon said. Merkle's, 3516 N. Clark St., is renaming itself thusly for the duration of the Cubs' playoff run. They've also extended honorary ownership to the Chicago Cubs manager. Three beer-infused cocktails were created and named after Maddon's flamingo friends, including one that joined him at a recent news conference. The bar will also offer Maddon's Mule and Joe's Nachos. 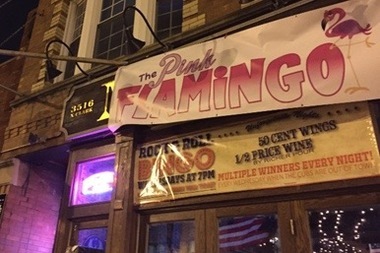 In addition to the Pink Flamingo sign, the bar formerly known as Merkle's will have flamingo decorations, and half of the proceeds from three flamingo drinks will be donated to Susan G. Komen Chicagoland Area on Maddon's behalf. • The Butcher's Tap, 3553 N. Southport Ave., will have goat tacos with queso fresca, jalapeño lettuce salsa and pickled vegetables. • Lowcountry, 3343 N. Clark St., will have $5 drafts of Chicago brews while playing Cubs games on 70-inch televisions. • Lakeview East Chamber of Commerce, 3138 N. Broadway, is giving away Cubs W signs.